Before planes and trains, the Great Lakes served as a major thoroughfare for moving people and goods between the East Coast and the Midwest. However, the 1800s proved to be a treacherous time for ships without modern-day technology warning captains of shallow waters, rocky islands, and weather to avoid during their routes. It is estimated that 6,000 ships have sunken in the Great Lakes, 2,000 of which are just off the shores of Cleveland, Sandusky, and Lake Erie’s Islands of Ohio in Lake Erie. The storied pasts of the disasters off of Ohio’s shores can be explored via dive exploration and tourism, with diving charters offering unique excursions into the eerie waters of Lake Erie. 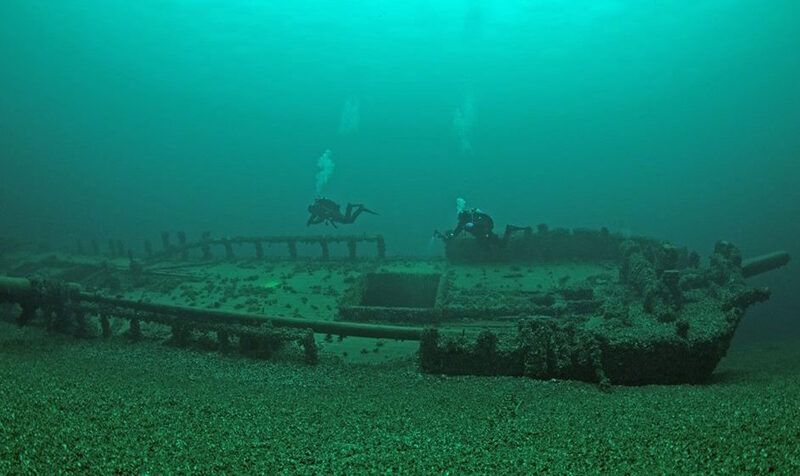 Unlike shipwrecks in the ocean, sunken ships in the Great Lakes are better preserved due to lack of salt corrosion and waves that can move ships. Want to explore these shipwrecks of Ohio? These dive operators will help you get there, although a word of warning: the lake is cold in the summer, and you’ll want full scuba gear to stay warm during your adventures! Special Shipwrecks and Scuba – Divers can also take part in the annual Shipwrecks and Scuba event at Kalahari Resort in Sandusky, Ohio. Highlighting dives across all five of the Great Lakes, the annual show takes place this year in November.